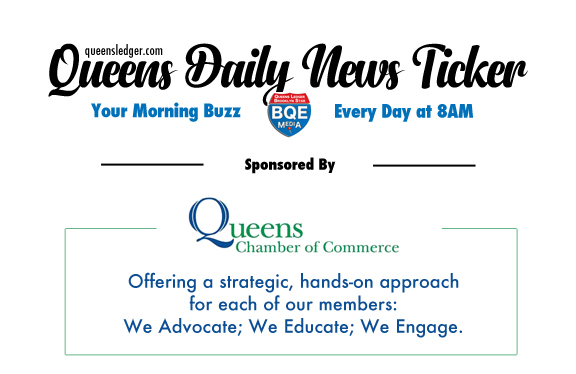 Morning Buzz sponsored by the Queens Chamber of Commerce. • MS-13 gang member has been arrested as the second suspect in a fatal shooting on the 7 train platform over the weekend. • A Queens woman was slashed in the face by a man harassing her, who then robbed her. • MS-13 gang graffiti was found scrawled outside a Queens councilman’s office. • The Post says the Pope’s visit to Abu Dhabi on Monday is a sign of UAE leadership’s enlightened attitude and how it filtered down to Emirates. • Queens Blvd. restaurant Natural Tofu permanently closes after a water main incident, while owners face a wages lawsuit by a former employee. • Here’s what you can expect in Astoria as the new round of N/Q stations are set to close for renovations. • State Senator Michael Gianaris, a vocal critic of Amazon’s LIC project, has been appointed to a board that could veto the project. • Sold – Jamaica Estates – A 4-bedroom, 2.5-bathroom, 5,050-square-foot Tudor-style home at 85-12 Wicklow Place sold for $1.08 million. Realtor. • Popular messaging app WhatsApp has been upgraded to have the ability to be locked using Face ID and Touch ID technologies. • Flushing - All Day Event – Traditional Chinese Paper Cutting exhibition. International Buddhist Progress Society, 154-37 Barclay Ave.
• Long Island City – 9 a.m. to 3:30 p.m. – Mid-Winter Adventures, rock-climbing class for kids ages 5-12. Brooklyn Boulders Queensbridge, 23-10 41st Ave.
• Flushing – 10 a.m. – Chinese New Year Celebration. International Buddhist Progress Society, 154-37 Barclay Ave.
• Jamaica – Noon – The Blessing Ceremony Lion Dance. Resorts World Casino, 110-00 Rockaway Blvd. • Jackson Heights – Borough President Melinda Katz attends annual Losar Ceremony. United Sherpa Association, 41-01 75th Str.